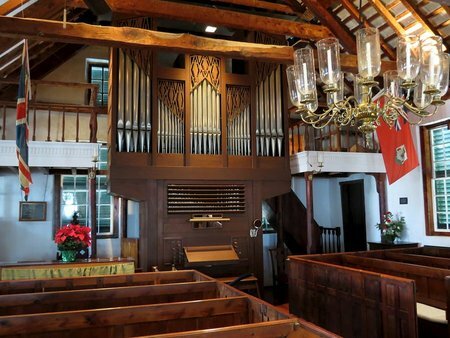 Located in the historic town of St George, St Peter's Church is believed to be the oldest continually used Anglican church in the Western hemisphere. The church was not however the first house of worship to stand on this site. It replaced a 1612 structure made of wooden posts and palmetto leaves that was destroyed in a storm. The present church was extended in 1713 with the tower and wings being added in the 19th century. The oldest part of the church is the area around the triple-tier pulpit. 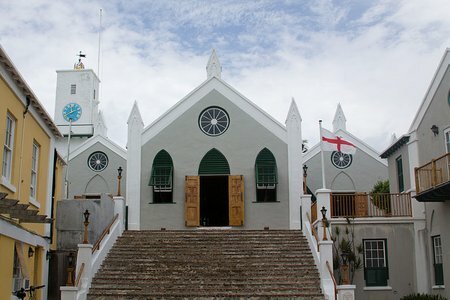 The first Bermuda Parliament met at the St Peters Church in 1620, making it the 3rd oldest parliament in the world. The church inside has a wonderful and simplistic ambience with exposed cedar beams in the ceiling, rough wooden pillars and candlelit chandeliers. The church has many treasures. Inside you will see the altar from the original structure. It was built in 1615 under the supervision of Bermuda’s first governor, Richard Moore. This is the oldest piece of woodwork in Bermuda. The font of St Peters church is over 500 years old and was brought to Bermuda by the first settlers. The late 18th-century bishop's throne is believed to have been salvaged from a shipwreck. There's also a fine collection of communion silver from the 1600s in the vestry. As you walk outside to the churchyard, you can see two graveyards. A walled area to the west of the church was for black slaves. The one on the east was reserved for whites. St Peters Church is an important site on the African Diaspora Heritage Trail of Bermuda that traces the legacy of Bermuda's slavery. In 1698, St. George had a population of 1,124. One-third of that were blacks who were mostly brought in from Africa as slaves. As the blacks started becoming Christians, they too were entitled to Christian burials. So a separate graveyard was added by extending the existing one towards western side. It was done in the latter 1600s for burial of the blacks. You will see that like many other churches in Bermuda, St. Peter's Church also has a separate gallery at the western side so that the blacks could attend the services. This gallery was built in the early 1700s. The entrance to this gallery was through a separate door at the north west corner of the church. The church graveyard was closed for burials in mid-19th century as new cemeteries were built in St. George. As you walk around the graveyard, you can see graves of some prominent Bermudians, including Governor Sir Richard Sharplesas well his aide-de-camp Captain Hugh Sayers who were both assassinated in 1973. Some of the tombstones in the Graveyard of St. Peters are more than 3 centuries old. You'll find the grave of Midshipman Richard Sutherland Dale, an American who was the last victim of the War of 1812. He was a 20-year old young soldier who was brought injured at St. George's. The people of St. George took delicate care of Dale but he died in February 1815. His body was buried at St. Peter's Church graveyard. For a long time a ceremony was held here in his honor on the America's Memorial Day. Even now a memorial and a dinner is sponsored by the Friends of St. Peter's Church every year in his honor. It is believed that other than Dale, several other Americans including 14 American prisoners of the war were also buried at this churchyard. Other notable graves here are that of slave pilot Jemmy Darrell, Governor George James Bruere, Ann Bingham who was known as the 'Jackie Kennedy' of American Revolution, etc. Close to the back entrance of the St Peters Church you can also find a 500-year old cedar tree; its branches once bore the church’s bell. Update March 2012: In the 400th anniversary of St. Peter's Church, Queen Elizabeth-II has honored the church with the royal title "Their Majesties Chapell". Note the double 'L's in the word Chapell. Such term for a church was first used in the late 1600s. 10am to 4pm, Monday to Saturday all throughout the year. Closed on Sundays (except for worship), Christmas day, Boxing day and New Year. Admission is free, however donations are encouraged (suggested $5). Guided group tour of the church can be arranged with advance notice. Visitors on wheelchair can access the church through the door behind. The main entry to the church has 26 steps to negotiate to reach up to the front Cedar door. Sunday service at 11am (Holy Eucharist - with organ and choir using Common Worship and Sunday School). Wednesday service at 9:30am (Holy Communion - a traditional common worship at the 1612 Communion table). 33 Duke of York Street, St. George's Town. 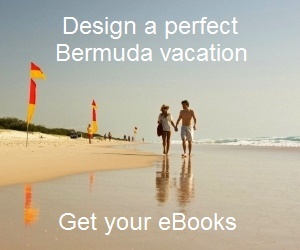 Check out Bermuda Tourist Map to view the location and other nearby attractions. While coming from the dockyard (Kings Wharf), you can take the direct Orange Route Ferry to St George (takes 35 minutes, this is the shortest route). However, the ferry has only limited runs and does not operate on Saturday & Sunday. Alternatively, take the Blue Route Ferry to Hamilton City. From Hamilton, Bus Routes #1, 3, 10, 11 will take you to St George's Town (about 1 hour). From the town center of St George (Kings Square) and Ferry dock, St Peter's Church is a few minutes walk. Ferry fare is $4.50 by token and $5.00 by cash for both Orange and Blue Routes, and same for bus. You can also use a 14-zone ticket in both bus and ferry from a pack of 15 (the pack costs $37.50). 3) Check out St George Bermuda to find out other great attractions in the area. I wish to thank you so much for placing an American Flag in front to the grave and marble covering for Midshipman who was wounded in 1812-14. You in Bermuda cared for him until he died. His parents sent the marble memorial cover to his grave and it is STILL there for viewing. Hi, yes it's the grave of Richard Sutherland Dale who died in 1815. Even today, the Friends of St. Peter's Church sponsor an annual memorial service and dinner in honor of Dale.